Pest description and crop damage Garden symphylans are sometimes called garden centipedes. When fully grown, they are not more than 8 mm long, have 15 body segments, and 11 or 12 pair of legs. They are slender, white, with prominent antennae. They can be mistaken for springtails. Symphylan feeding on roots can damage plants. Their ability to do damage decreases as the plant ages, but their pitting can allow entry to plant pathogens. Surviving plants may be stunted with reduced yields. 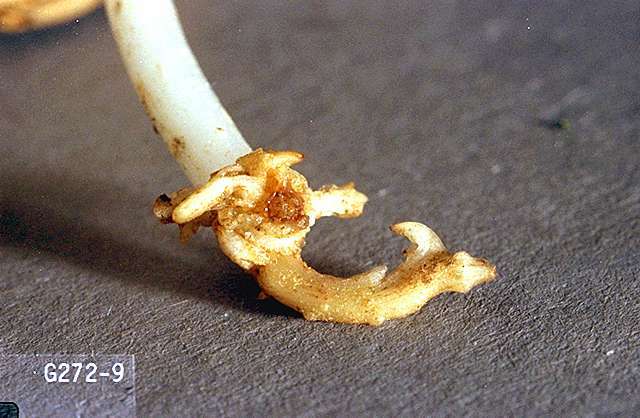 Damage shows up as weak spots in a field although similar damage may be the result of root lesion nematodes, root weevils or root rot. Biology and life history Eggs, nymphs, and adults can be found in the soil in any month of the year, but most eggs are found in the early spring and fall. Eggs are laid in clusters of 4 to 25, and hatch in about 40 days. Nymphs and adults become active in the top 8 inches of soil. Nymphs feed on small roots. There are one or two generations per year. Scouting and thresholds Presence of symphylans can be confirmed by taking a soil sample with a shovel down to a depth of 8 inches. Thresholds for action are not well-established although more than 5 per shovelful is an informal level for action. Symphylan populations may also be determined by baiting: put a longitudinally cut potato or carrot on the ground under a white bucket and check for symphylans after 24 hours. 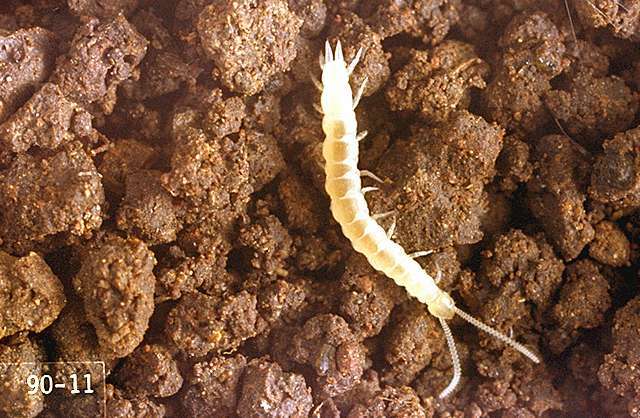 Many organisms feed on symphylans in the field, including true centipedes, predatory mites, ground beetles, and various fungi. Little is known about their effect on symphylan populations. Symphylan damage generally is associated with soils that are high in organic matter content and have good structure. Symphylans do not thrive in compacted or sandy soils, as these soils do not provide tunnels for their movement. Symphylans cannot make their own burrows. Packing down the soil surface after planting may provide some control. Flooding for 2 to 3 weeks has provided some control in some cases but not in others. No appropriate pesticides are available for strawberries in the home garden. chlorpyrifos (Lorsban and other brands) at 2.0 lb ai/a. Apply as a pre-plant broadcast spray and incorporate 2 to 4 inches.